Aloha friends! W Like most, we've been busy gearing up for the winter holidays. Decorating, crafting, shopping. I haven't started baking yet, but that's on my agenda. Tonight we're headed to "Winter Wunter Wand" as my kids call it (Winter Wonderland). It's a local holiday display of lights and antique animated figurines. I've been visiting since I was a kid and we go every year as a family. It's a tradition that just makes the holiday memories more special. My question this week: Is there a favorite holiday show or place you like to visit each year? 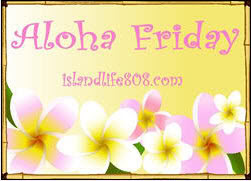 Be sure to stop by An Island Life for more Aloha Friday fun. The original Miracle on 34th Street since it was my father's favorite.. I use to love going to Candy Cane Lane in Milwaukee. I want to watch 'It's a wonderful Life again" and we LOVE to drive around and look at the lights on homes. Every Christmas we head on over to the Honolulu Hale to see the Christmas tree and lights display. We also take a ride on an old-fashioned fire truck around downtown Honolulu. It's become a family tradition! Hi. Visiting you from Bloggy Moms. Please stop by www.mommymasters.blogspot.com and follow back. You can also see me at www.facebook.com/mommymasters and click "Like". Let me know if you have a Facebook page I can visit too. Thanks! I love spending time at my parents house in the country.